Continuing our Thursday lunchtime community shows under the banner of The Health and Wellbeing Hour, Shed Happens is the men’s magazine show presented by Frome Men’s Shed. 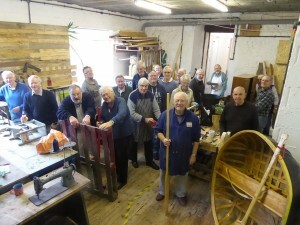 The show will feature conversations with some Frome Shedders, an update from the UK Men’s Sheds Association, and news about Men’s Sheds across the Country. There’s some music, including “Making Tracks”, a piece of music that Shedders commemorate with a tough project.